Boston weather can be unpredictable from one moment to the next. 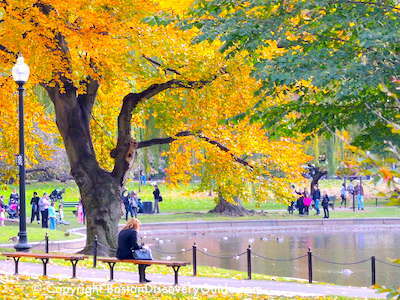 Fortunately, a local saying sums up it up accurately: "If you don't like the weather in Boston, just wait one moment." Although we have four distinct seasons, you'll find lots of overlap: occasional warm days during the winter, and in many years, colder days than you might imagion during the first part of June. Our coastal location can create unpredictable weather patterns and cause rapid changes in temperature and other conditions: howling nor'easters, blinding blizzards, torrential downpours, an occasional hurricane. Even tornadoes - rare in this part of the state - do occur. In particular, you need to be prepared for the extremes you might occasionally encounter, especially if you're planning to drive here during the winter. Take a look below at average monthly Boston temperatures and other weather statistics. Pay special attention to record highs and record lows. Sure, these are the extremes - but in plenty of other years, temperatures can come close to these highs and lows - so when you're packing for your trip, be prepared! You'll also notice that precipitation is fairly evenly distributed among all the months of the year. We get between 3 and 4 inches of precipitation every month except for February, which of course has fewer days. The largest average about of precipitation in a year happens during March. Keep in mind that in below-freezing weather, a few inches of precipitation translate into a lot more inches of snow. Weather data is courtesy of the National Weather Service, where records for Boston date back to 1872. Record high and low temperatures are for the period 1872 - present. Average temperatures and precipitation are for the period 1981-2010. 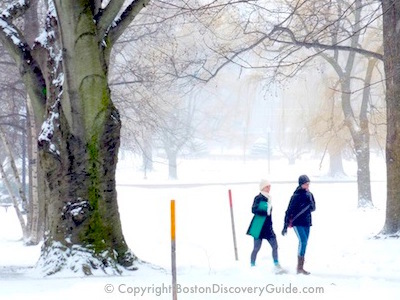 Best winter Boston tours - Don't let cold weather slow you down! Where to ice skate in Boston - Best rinks in Boston! Skiing near Boston - Where to enjoy the snow! Extreme Boston Weather - Want to know more about blizzards & nor'easters? 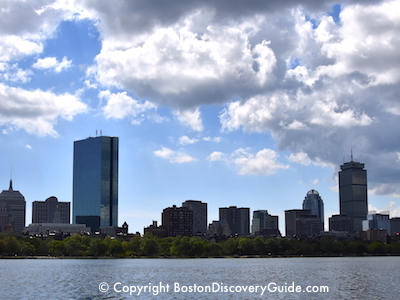 Boston Kids Activities - Suggestions for indoors and outdoors . . . whatever the weather!